They worked with Vitacress, one of the biggest producers of packaged salads, to understand what keeps salad leaves fresh for longer. Their results are now being used in breeding programmes and within Vitacress’ own practises to produce salads with a longer shelf life. Before they reach our supermarkets, baby salad leaves undergo rigorous processing that includes harvesting, transportation, washing, sanitisation, removal of excess water, and packaging. Only the most robust leaves can survive this process without being bruised and damaged. This makes growing salad crops with ‘processable’ leaves extremely important for the packaged salad industry, as it reduces waste and increases shelf life. “So we’ve used fundamental biological knowledge and applied it both through the genetic route and through crop production techniques to help the company improve the quality of their product,” she adds. Following the success of their IPA project, the partnership between the researchers and Vitacress has grown to include a seed company in the USA, who are using the results of the project in their breeding programmes, and Sainsbury’s, who sell many of Vitacress’ products. 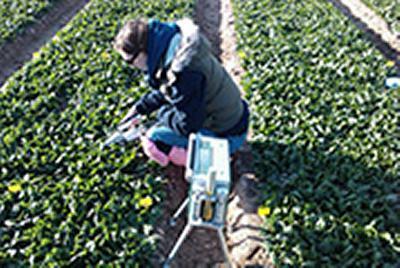 Sainsbury’s and the seed company have jointly funded two of Professor Taylor’s PhD students.